When it comes to introducing a business, most owners knows the importance of making sure people are familiar with your company. In Sensa Float’s case, they faced this common scenario along with a little challenge—making sure people were familiar with their industry. Sensa Float is one of the few flotation therapy businesses breaking ground in the San Antonio area. Because their industry is relatively new to the scene, we knew that we had to use their website to educate the market on what their business was as well as who they were. 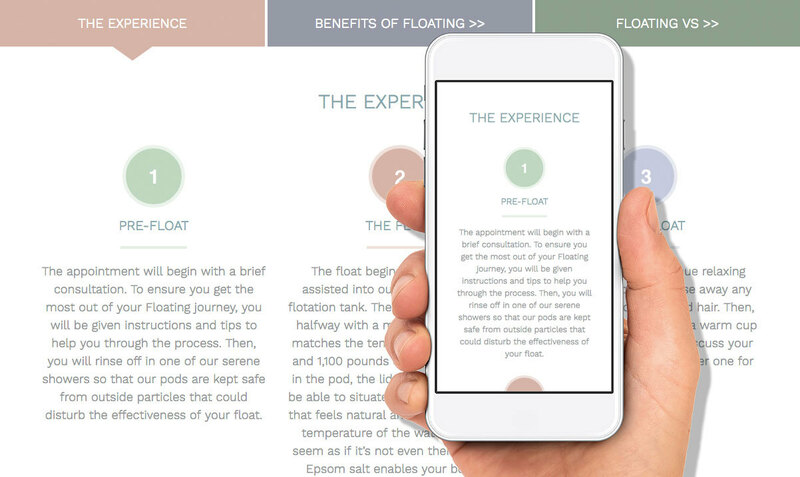 To do so, we created a site that functioned as a one-stop-shop for customers looking to learn about what flotation therapy is and why they should choose Sensa Float. In order to get their target audience familiar with their industry, we implemented a tool that compares floatation therapy to common types of therapy, like massages, spa treatments, and acupuncture. The ability to compare the similarities and differences between these therapies and floating gave customers familiarity, as they were able to get a general idea of the purpose of flotation therapy. Additionally, we provided a thorough, step-by-step description of the floating process. By walking the customers through the experience beforehand, they were able to get a feel for the nature of floating and feel more comfortable with the idea of trying the alternative therapy. To truly sell the audience on flotation therapy, we implemented a list of benefits that the customers could use to see the various issues flotation therapy can help with. By providing this information, customers could clearly see why flotation therapy was the best choice for those seeking overall relief from mental and physical strain. 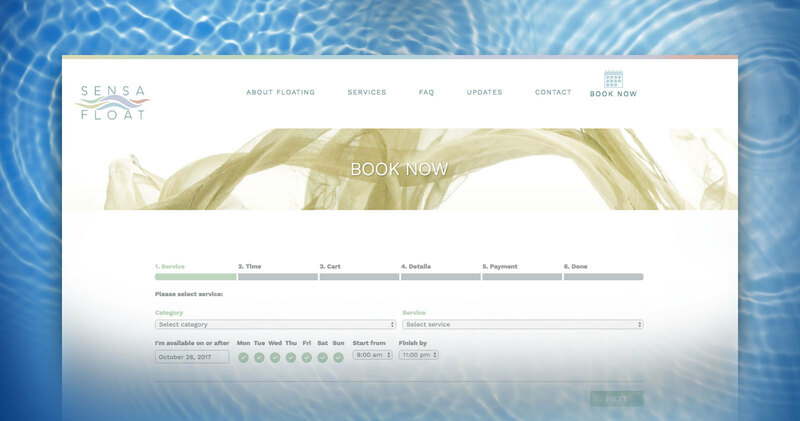 To make sure their customers had a seamless line leading them from the website to the flotation tank, we were sure to implement an easy-booking functionality using Bookly. This page made booking reservations a breeze, as visitors could easily select the day, time, service, and amount of time they wanted to reserve. To convince their audience that Sensa Float was the right choice for those considering flotation therapy, we began by designing their website in a way that set them apart from their competitors. While other companies had similar websites with obvious design patterns, Vuepoint decided to take the road less traveled. Our graphic designer took the concept of floating and turned that feeling into a tangible design scheme. With images and patterns that highlighted the serenity of floating and enhanced the idea of being in tune with your senses, Sensa Float had a website that was easily identifiable and undeniably unique. Similarly, we implemented a blog and FAQ page. Here, our content writer could share Sensa Float’s knowledge and expertise with customers and utilize that information to paint them as industry leaders. Whether there were interesting stories to be shared or common questions to be answered, Sensa Float had two useful outlets to enlighten their audience. Because we were determined to build up the brand name, we also created a section where customers could leave comments and share stories about their experience at Sensa Float. This section, while user-controlled, played a crucial role in gaining the trust of their audience, as they could read about other customers’ first-hand experiences in order to help shape their opinion of the business. With both aspects of the website working in unison, we were pretty excited to say that we had created the ultimate hub for all things flotation therapy. Not only was the brand name able to be seen as industry leaders, but their website functionality was able to enhance user experience and turn traffic into conversions.